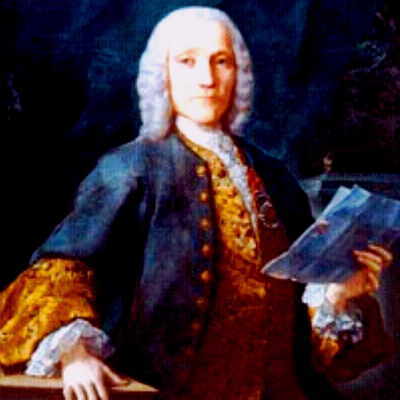 Domenico Scarlatti was born into an illustrious musical family, auspiciously in the same year as two other great Baroque composers, J. S. Bach and Handel. He received early training from his father Alessandro Scarlatti (1660-1725), chapel organist and composer in Naples, who encouraged him to write vocal music. As a young man Domenico went to Venice where he met Handel and allegedly competed in a keyboard “duel,” where he was judged the equal of Handel on the the harpsichord but his inferior on the organ. In 1709 he moved to Rome, expanding his training with Pasquini and Gasparini (student of Corelli). In Rome he served as maestro di cappella for the theater of the exiled queen of Poland, then in 1714-19 serving as maestro di cappella at St. Peter’s in the Vatican. During this period he composed mostly sacred vocal works and operas. For most of his life, however, he served in the royal courts of Portugal and Spain. There he indulged in his real passion for the harpsichord, composing 555 highly original keyboard sonatas which secured his lasting fame (although few of them were published during his lifetime). His music shows evidence of the influence of Spanish folk and dance music, which he loved. You can hear flamenco effects in his use of guitar-like harmonic and rhythmic patterns, striking dissonances, arpeggiated “strums,” quick repeated notes, ornamental accents, and the use of the Arabic Phyrgian mode. His works were characteristically Baroque in their binary form and contrapuntal texture, however Scarlatti’s use of tonality prepared the way for sonata form and the Classical era. The first section unusually modulates to a new key, and the second section finds its way back to the home key. Teaching Tip: See if your students can hear the guitar effects in Scarlatti’s Sonata, K. 455, for harpsichord. The music animation will help the eye follow the overlapping visual lines while the ear focuses on the musical lines.